Guiding your child through her/his exciting educational journey is a wonderful experience and privilege that we as parents and educators share. We invite you to access the resources and information available at the School which is intended to bring you into the shared journey of educating your child. If you are new to the School, we are happy to have you join the JBA family and are here to help you. PTM’s are held on a regular basis when parents have the opportunity to discuss their child’s progress. Consultation with class teachers at other times can usually be arranged after school. 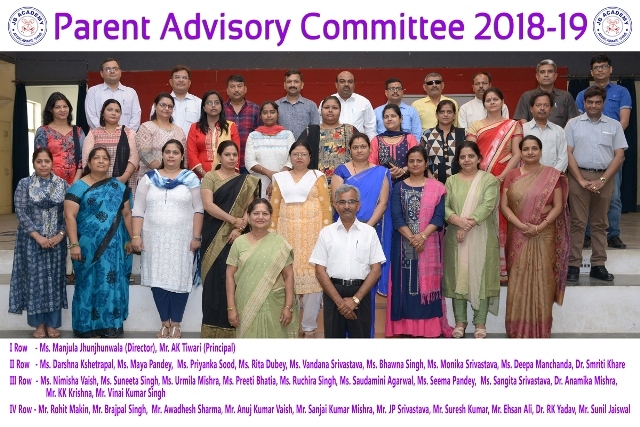 Parents are encouraged to volunteer or put themselves forward to be chosen as parent representatives (of the class) on the Parents Advisory Committee (PAC). 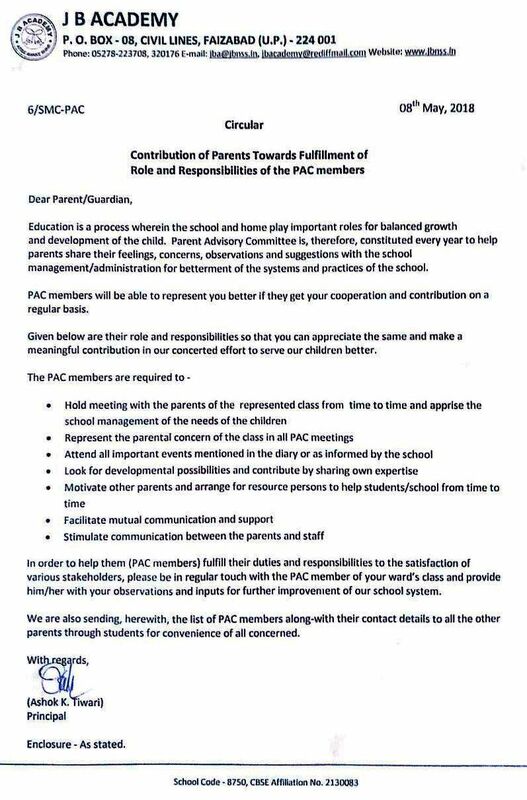 We urge you to get involved with the PAC. The PAC offers a wide variety of on-going and one time programs for you to be a part of. For a wholesome education it is essential that parents contribute to complement the education their ward receives at school. We have a number of parents who throughout the year support the school by giving their time and sharing their experiences/expertise/observations/suggestions. Represent the views of parents. Involve with children's education and learning. Express their views on school education generally and work in partnership with the school. Promote contact between the school, parents, pupils, providers of education and the community. To interact with and collect feedback from other parents/students of the represented class/section. To attend all PAC meetings and important school programmes like Independence Day, Republic Day, Sports Day, Children’s Fete, Awards Function, Project Exhibition, etc. 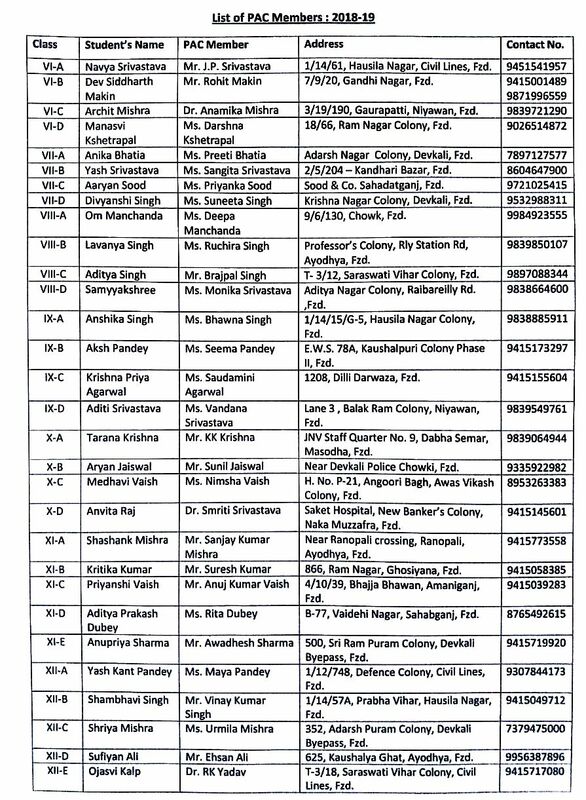 To give constructive suggestions for the improvement of the School. To extend a helping hand in various educational projects/programmes of the school.